I love… love…love home-grown tomatoes! I plant my own tomato starters in early March and wait for the heat of summer to turn those little red balls of tomato-y goodness into delicious, sugary treats. In fact, those cherry tomatoes rarely make it into the house. Vine-ripe and fresh picked, who can stop eating after just one or two or three? But darn it, this summer I am tomato-less. Please feel sorry for me. No pretty veggie plants grace my backyard. My excuse? Hello! We moved! Remember, Mr. Handsome and I moved into a new house and I just didn’t have the energy beyond unpacking to make it happen. So this year, the farmers markets have been my go-to tomato supplier. Which is actually kinda cool because they have so many colors–yellow, purple, green, red and different heirloom tomato varieties. It’s a whole new world out there. Way more flavors than I ever imagined. You can say it. Guess I gotta get out more. So today I came home with four baskets or cherry tomatoes. I came up with this Orzo recipe because I love to have two side dishes in one. We just paired it with some grilled chicken. A perfect summer dinner. Then we fought over the leftovers the next day. 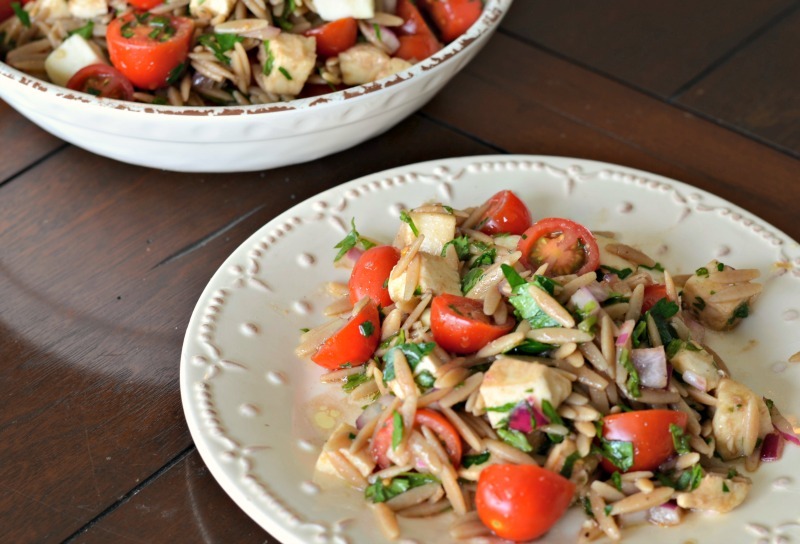 If you love Caprese flavors, then you’ll LOVE this Orzo Caprese Salad. Trust me. Bring water to a boil, add the salt and orzo pasta. Cook orzo according to manufacturer directions. Drain and rinse in cold water. Set aside to cool.. 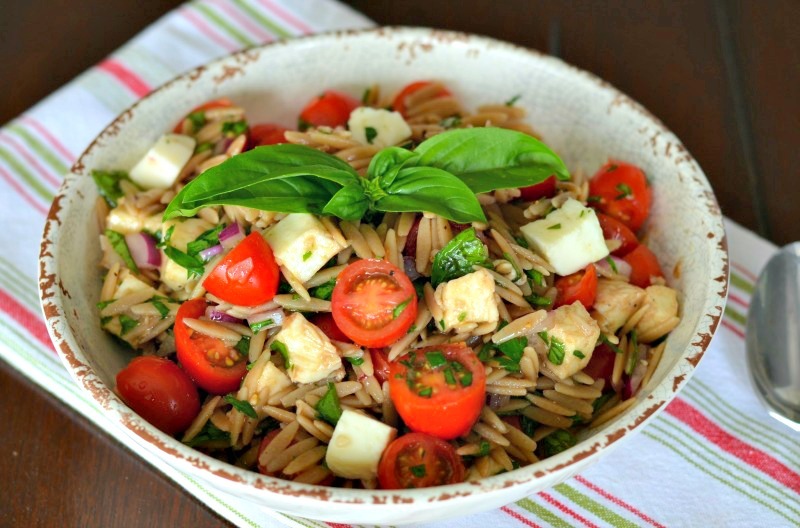 Meanwhile, toss the tomatoes, onion, basil, parsley and mozzarella in a bowl. Add the cooled orzo pasta. Blend the olive oil and balsamic vinegar together. Pour over salad a toss to combine. Serve at room temperature with a basil leave as a garnish.